The old-fashioned updo is gone for good. Soft and romantic speak to springtime, while opulence with an edge works perfectly in winter. 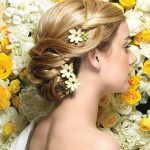 Against dramatic floral displays inspired by the seasons, we capture wedding-day looks for the modern bride, hairstyles that are easy and elegant with the element of surprise. The old-fashioned updo is gone for good. 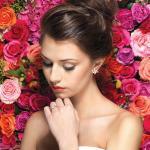 Spring: Monique Lhuillier Forever gown, $6,325; Paris by Debra Moreland Candide earrings, $489; Bridal and Formal. Spring: Amsale Harbor gown, $4,350; Paris by Debra Moreland Robin’s Departure hair ornaments (set of 2), $630; Paris Sugarcane earrings, $120; Bridal and Formal. Summer: Reem Acra Spellbound gown, $4,995; Paris by Debra Moreland Moonlight Waltz earrings, $180; Bridal and Formal. Kirk Kara engagement ring, $3,630, The Richter & Phillips Co. 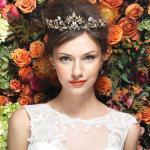 Autumn: Christos Anabelle gown, $5,200; Paris by Debra Moreland Fields of Gold headpiece, $690; Bridal and Formal. Winter: Reem Acra Olivia Wilde gown, $5,950; Paris by Debra Moreland Objects of Desire earrings, $420; Bridal and Formal.